Diego Sánchez is a Spanish filmmaker. A self-confessed geek from his early days at Journalism School in Spain, Diego decided to go abroad and his love of film took him to study at the London Film Academy, shoot his first short movie at Universal Studios Hollywood, and visit Pixar Animation Studios in San Francisco. Now based in London, Diego is working his way up in the film industry and devouring every film that crosses his path. With a short film in competition at the Phonetastic Sitges Film Festival and the chance to be part of the BFI Film Festival closing ceremony, Diego is a young filmmaker to watch. Where did the idea for Giggles come from? I have a passion for horror films and I love the concept of exploring the narrative possibilities of an unbroken shot in films. So I basically decided to make a horror film on an unbroken shot with virtually no budget to push both myself and the director of photography. I convinced the owner of the house where I’m living to film there. So I basically walked through the whole house, a notepad in my hands, writing down ideas, pictures and shots that came into my head. Then I sat in front of my computer to make a three-act structure out of all of that. It was all about turning your house into a nightmarish place. The film is currently competing to be part of the closing ceremony at the BFI Film Festival. What does that mean for your film? If enough people vote for Giggles on the web and the jury think it’s good enough, it will be screened during the closing ceremony of the BFI Film Festival in Leicester Square. The exposure and networking that a chance like that offers might be the push our careers need. Besides, the sound designer and mixer of the film, David Prosser, made an amazing surround mix. Screening the film on a surround system and a big screen would definitely be a great experience. 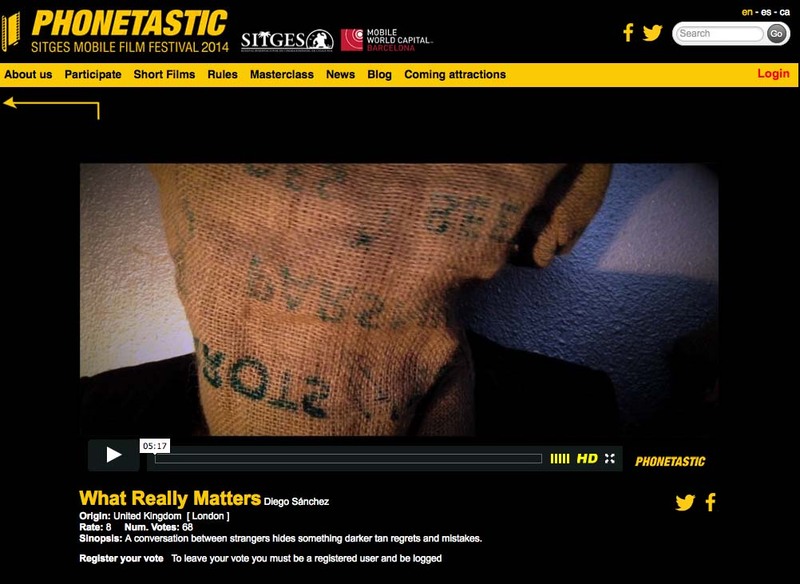 You’ve also recently directed another short film, called What Really Matters. Tell me about that. One night, back in July, as I was reading a book in bed, I felt the urge to take a camera and just shoot something. I took a one-page-script by Donald Macnab-Stark and started working on it with another friend. Three weeks later we were filming and another three weeks after the short was ready. We wanted to play with the idea of the audience being unaware of what is really going on and slowly revealing more information. I wanted to send the short to a contest or a festival, and I decided to send it to the Phonetastic Sitges Film Festival in Spain. I’ve attended that Festival four years in a row as a journalist and for the first time I’m going to be an active part of it. It’s very exciting. What did you enjoy most about directing these shorts? How much I learn about filmmaking by doing these projects. Working with the screenwriters who helped me get the story right; planning the shots and the lights with the director of photography, rehearsing with the actors, filming on the day and, of course, playing during the post-production phase with the editing or the sound design. It gave me the confidence I needed to feel ready for my next adventure, a very important and personal project I am currently working on. What was the most difficult part of making them? The most complicated and challenging of these shorts was definitely Giggles. Don’t get me wrong, making What Really Matters with an iPhone was quite an experience -how to light for these lenses, how much can you record before you have to stop to recharge the battery or download the footage from your full memory card… It was not easy. But Giggles was a massive challenge. I worked very closely with Oscar S. Velasco, the Director of Photography, to achieve a cinematic look on an unbroken shot with almost no crew. At the beginning, I was trying to direct the lead actress, shouting orders to the actors and crew in other rooms as I was pulling focus trying to be in a synched choreography with the cameraman and the actress. It was madness and it didn’t work. Thankfully, we managed to get a focus puller so I could just focus on directing everybody.